Blogging the easy way to make money online, wrong it's not like that, it's need lot of hard work and also mind blowing motivation with full dedication, if you want to become a money making blogger you have to do these three things. 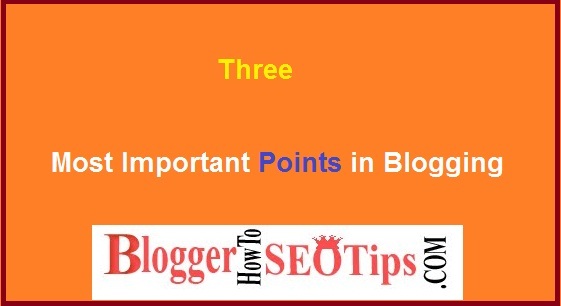 Because, if you want to make money from blogging then you must have to think about three most important points about blogging. (Those Points Enclosed in This Article). Although three points are not good enough to create a popular blog, but at least these three points will help you to create a good blog, that's why you can make money online from blogging. In this article, specially I will tell you these three most important things that's why you will become a great blogger. Simply think about this, if you are writing tips for climbing on tree then probably you are not going to make any money right, so this is the most important decision for blogger. That, what people are looking for in the world from internet, see if you want to make money online then you have to do something new may be the same thing people are doing, but you have to do the same thing in different way. That's why people can solve their real problems. One of the best way to find out what people are looking for in the internet is Google suggestions on the search result, just search what you wanted to write on your blog and then see on the bottom suggested keywords. Write article around those keywords, which will help you a lot to get fresh traffic to your blog. Now after knowing what people are looking for, the next step is to know, what you know may be little bit, because if you know something then you can write about that thing better than about any unknown thing. Because every niche having competitions, so if you want to beat competition directly then there is only one good way, that is just providing new and valuable contents to your readers. Always think that you are still a beginner in blogging, this type of thinking really need in blogging, because in blogging you need to think and write better way, to make it happen for you, means to get your self in professional blogger category. Now next decision is how much time you can give to blogging, because to build decent readers for your blog, you need to give time to your blog and also while writing an article. Then you have to give time to your blog that's why you can provide valuable content for your readers, yes don't do these activities, because these activities will waste your time. See blogging is the good way to make money online, but it needs more dedication, concentration and more important that is time to make decent money from blogging. May be you have seen an advertisements that, this man earned this much in over night, this is not possible, don't even that man got! Have you ever think, anyone will give you, even a single cent for free, NO! So, Always live in reality to become a professional blogger, keep hard working in your blog, to take your blog to the next level. First Read the blog post completely then it will definitely help you to SEO your blog.